Chinese businesses and investors are storming Uganda and Africa as a whole. How will this shift affect the future of the continent? Ugandans are not the only ones who know their country is brimming with resources. China, which has a long track record of strategically trading with and assisting African countries that have resource potential, is becoming increasingly involved in Uganda. But it’s important for Ugandans to remember that China is not increasing its presence here just for charitable reasons. Take the discovery of large oil deposits in western Uganda. Though the oil is still underground, companies are already engaged in exploration and chief among them is the China National Offshore Oil Corporation (CNOOC). CNOOC is one of China’s three major national oil companies. According to reports, it intends to partner with Total and Tullow Oil to build an oil refinery in western Uganda. 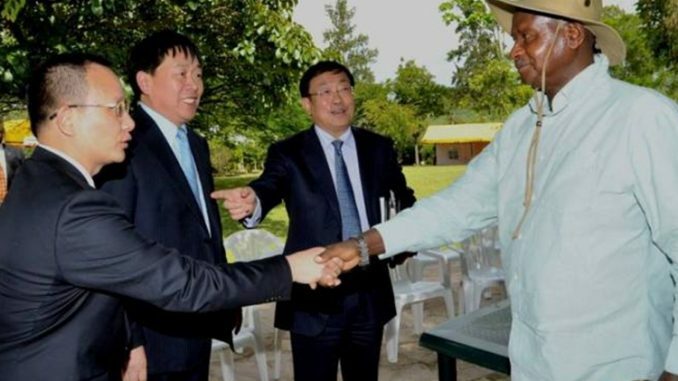 Sun Heping, the Chinese ambassador to Uganda, recently said, “China aims to assist Uganda build its own oil industry through participation in the production of oil products”. President Museveni welcomed this move. Beyond the oil industry, there are a number of Chinese workers in Uganda employed in infrastructural development, education, health and agricultural projects. According to information from the Chinese embassy in Uganda, another 5,000 Chinese are in the country pursuing private entrepreneurship. The Chinese are generally respected as hard workers, which helps their companies win tenders in areas like road construction and maintenance. Ugandans can testify to this: There are many road construction projects that Chinese companies have successfully completed in the country. Chinese-owned companies constructed Mandela National stadium, State House Entebbe and a host of other government office buildings. And China is set to fund the proposed Kampala-Entebbe highway expected to cost $350 million – through a preferential loan. As an additional benefit, these projects employ thousands of Ugandans and put money back into the government through taxes. The development isn’t just infrastructural, but also intellectual. China offers scholarships to Ugandan students, enabling them to pursue continued education in China in areas from technology to medicine. More than 1,000 Ugandan students are currently studying in China on hese scholarships. China enjoys good trade relations with Uganda. China sends mechanical and electrical products, chemicals, and textiles to Uganda, while Uganda exports coffee, cotton, leather, honey, and scrap metal to China. Statistics from the Uganda Export Promotion Board show Uganda’s exports to China stand at about $20 million, while imports from China were about $202 million last year. Both countries have shown a commitment to mutually continue improving this trade balance. It’s clear China is contributing to the economic and social development of Uganda. Nevertheless, not all Ugandans are happy about the increasing Chinese presence in the country. Many Ugandan traders I talked to in Kampala’s downtown business area told me that the Chinese are “killing our country by using it as a dumping ground for unwanted products”. “Our city is flooded with fake products from China some of which are very detrimental to the health of Ugandan consumers,” one trader told me. Other retailers add that the Chinese products are undercutting the prices of their own goods and are outselling local merchants’ products because they’re more affordable. A spokesman for the Chinese Embassy in Uganda confirmed that China doesn’t have a policy of exporting fake products to Uganda and said the country was working on resolving any issue of fake products being sold in Uganda. There is also some contention about Chinese taking jobs that would ordinarily go to Ugandans. Local job seekers complain that Chinese companies prefer employing their countrymen. When a Ugandan does get a job in a Chinese shop, workers allege that the pay is low and the working conditions are hard. One worker at a large, well-established Chinese-owned hotel reported that he was offered Ush100,000 a month as a cleaner. Tired of working 12-14 hours, seven days a week, the man quit before he ever collected one shilling. “They work you until you cannot take it anymore and you quit before they pay you. They do this to all their employees and it is like they are getting free labour,” he said. The situation in Uganda is part of a larger trend across the continent. Away from Uganda, China is investing in many African countries with the aim of contributing to Africa’s economic and social development. Since 1949 China has been offering assistance to Africa. As part of this assistance the Chinese have announced that they will not get involved in dictating changes for political or human rights reasons. This principle was announced as early as 1964 by Premier Zhou Enlai and China has been sticking to it. At an Inter-Region Economic Network conference under the theme, “Is Eastern Africa ready for China, India and Europe?,” H.E Guan Gyuan, ambassador extraordinary and plenipotentiary of the People’s Republic of China to the Republic of Kenya emphasized that China’s assistance to Africa is selfless and pure. He said the alliance has always been and will always be aimed at promoting China-Africa economic and trade cooperation, mutual trust and all-around strategic partnership. The majority of the Chinese assistance to Africa is based on a government-to-government model through non-currency delivery and focuses mainly on developing projects around infrastructure, education and health, where Africans can see and feel a tangible benefit. China’s investments in Uganda are mirrored in countries throughout Africa. China is assisting with the construction of Bui Hydro power station in Ghana, an airport in Mauritius, a housing project in Equatorial Guinea among a number of other projects in Africa. China has also set aside $10 billion in preferential loans to be used by African countries in financing their infrastructure projects. In turn, African countries such as Tunisia, Seychelles, Nigeria, Mauritius and South Africa are increasing their investments in China. A joint venture started by a South African enterprise in China is now operating 70 breweries in China. Other African ventures in China are also doing well. In 2009, these ventures were estimated to be around $9.93 billion. Today they are projected to be around $14.5 billion. China is doing all this for a reason. It is doing so to gain access to rich Africa’s natural resources and to African markets, which it needs more than ever to meet its own rising developmental needs back home. As we talk today, many of the Chinese companies in Africa, are repatriating a big percentage of their profits back to their home country and in so doing, they are facilitating capital flight from Africa to China. This is in addition to China’s failure to curb allegations that cheap products are flooding Africa. And China is also criticized for its expressed policy of not attaching commitments for good governance, democracy and human rights improvements to its aid. All of which makes many Africans question the increased Chinese presence on the continent. African countries and China should clearly set their trade and aid conditions to incorporate economic development, social improvement and balanced trade. Having already acquired stakes in Uganda’s nascent oil industry, China’s interest in Uganda is now higher than ever before. As relations continue to improve, Ugandan officials should be advised to do as the Chinese do and put the interests of their own people and country first.